I'm a novice with Gimp. In the course of using it to check some images I found that it seems to dither displayed images by default. This makes a better looking image on screen, but it prevents me from seeing when my data path is 8 bit versus when it is correctly working in 10 bit. To verify this, I am using a 10 graphics card and display connected with displayport along with an 8 bit display connected with DVI. If I drag a 10 bit ramp that looks smooth on the 10 bit monitor over to the 8 bit monitor it looks the same because dither is masking the 8 bit ugliness I am trying to watch for. Can anyone advise me about how to disable the FS dither use either temporarily or permanently? I don't have the ability to do a special compile, but if that is what is needed, I can ask a friend to do it. I just need help to know what to modify to make it happen. Your question is somewhat out of my expertise, but are you sure that it is Gimp that creates this universal anti-aliasing. No correction that I can see, but then I am still in the dark ages using VGA into the monitor (for my KVM switch). The only display setting I am aware of is, View -> dot-for-dot but at high magnification this makes little difference. It might help if you give details of the type of images you are working with, for example you can save a gif file with/without dithering, (but that is not anti-aliasing) and the hardware you are using, (some Apple gear have clever displays). Maybe someone will come up with a proper answer. The issue I am looking at is not related to anti-aliasing which would be applied on text, but rather noise that is added in gradients to mask 8 bit banding artifacts. So the conclusion I reached is that while Gimp 2.9 supports creating images with more than 8bpp depth, it does not display them onscreen. It also applies dither to gradients to reduce banding. 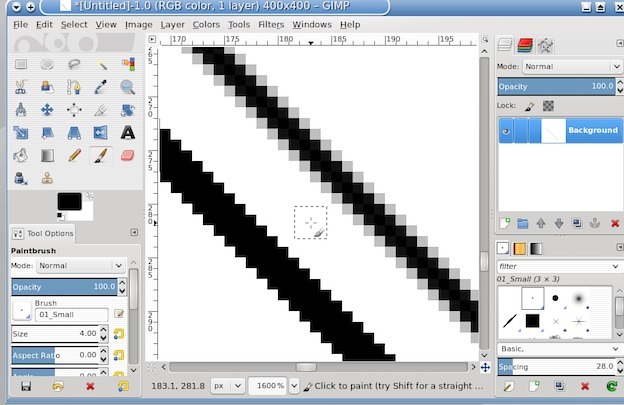 The graphs below show what a segment of a ramp looks like from CS6 and from Gimp 2.9. You can see from the result that Gimp is adding noise.